12 Mistakes of Dermal Needling You Should NEVER Ignore !! Dermal Needling aka micro-needling, derma-rolling or dermarolling can trigger your body’s wound healing mechanism, thus stimulating collagen and elastin production without the use of topical products. As a result, you experience many anti-aging benefits, including the reduction of fine lines, wrinkles and scars. Since dermal needling is a non-invasive treatment, it will not damage your skin like chemical and laser treatments, and has very little down time (only 2 to 7 days). Dermal Needling also creates thousands of micro channels into your skin. This allows all topical products to bypass the epidermis and directly enter your skin, thereby increasing their concentration and boosting their efficacies. On the other hand, dermal needling can produce unwanted side effects if you don’t take the following precautions. I highly suggest that you read Part 1 and Part 2 of this article carefully before starting your treatment. You will definitely thank me for it! For part 2 of this article, please click the link below. You should never start a treatment without disinfecting your derma roller first. A dirty roller can introduce bacteria into your skin, thus causing inflammation or infection. You should never skip this important step! It is highly recommended that you disinfect your roller with Isopropyl alcohol, hydrogen peroxide or even denture tablet by soaking it for 20 to 30 minutes before and after your treatment. Do not use boiling hot water to disinfect your roller. Since your roller is made of mostly plastic, doing so will damage your device. Do not use a spray bottle filled with disinfectant to clean your roller. Doing so will not clean your roller effectively. Since derma rolling produces 1000s of micro channels in your skin, you MUST clean your skin with a gentle antiseptic/antimicrobial cleanser or alcohol before treatment. This will remove dirt, oil and impurities, thus preventing them from entering into your skin through the micro channels and causing an infection. Since dermal needling treatment can drastically intensify the absorption and potency of all topical products, applying products with irritating or toxic ingredients can result in increased irritation or toxicity in your blood stream. Using a topical product with derma rolling is completely optional. If you are unsure about the ingredients in your skin care product, please do not apply it on your skin immediately after a treatment. You should wait at least 24 hours before applying. Below are several ingredients to avoid. For in-depth information, please read “The Concise Guide to Dermal Needling” by Dr Lance Setterfield. Many people think that a derma roller can treat all types of scarring, but they are wrong. Keloid scars are an abnormal skin condition caused by an excessive amount of collagen growth during the healing process. Since dermal needling also triggers your body’s healing process, treating keloid scars with a derma roller will worsen your condition. DO NOT derma roll if you tend to get keloid scarring. Contrary to popular belief, more treatments will not get you better results. Having more than 1 treatment per day will increase redness, irritation and slow down recovery time. There is also a risk of getting infection and ugly temporary needle marks. You should avoid having more than 1 treatment per day. You can only use 0.25 or 0.3mm roller daily or every other day. Since 0.5, 0.75, 1.0 and 1.5mm rollers can induce micro trauma and inflammation in your skin, this can lead to the production of collagenase, which is an enzyme responsible for breaking collagen apart. Using these particular rollers (0.5 to 1.5mm) daily will result in prolonged inflammation. As a result, this will generate an excessive amount of collagenase, thus boosting the rate of collagen breakdown and resulting in the loss of collagen. For this reason you should only use 0.5, 0.75, 1.0 every 4 to 6 weeks and 1.5mm every 6 to 8 weeks. The skin on your upper eyelids is extremely fragile, thin and sensitive. It can become irritated easily. Also, your eyelids sit on top of your eyeballs. Therefore, you should avoid rolling your upper eyelids. If you are trying to treat drooping/sagging eyelids, then dermarolling WILL NOT fix the problem. You need a surgeon for that. Do Not roll your upper eyelids! You should never judge your result by the how much you bleed. Many people mistakenly believe that bleeding is a sign of good result, but this is completely untrue! If you are using 0.25mm roller, you will not going to see any blood at all! You will simply encounter minimal to mild bleeding with 0.5 to 1.0mm roller unless you roll your skin excessively. Also, bleeding is rarely seen when treating areas of the body with high percentage of fatty tissues. Therefore it is normal to only notice several red marks with body treatment especially around the leg areas. It is never a good idea to force your skin to bleed via excessive rolling because this can induce prolonged recovery time, redness, swelling, irritation, needle marks as well as mild infection. Dermarolling with a defective roller can harm your skin, and you should NEVER use it. Therefore, you MUST check your roller for defects before treatment. Your roller shouldn’t get stuck during a rolling session, and it should roll freely. Otherwise, it is a bad roller. Examine your roller closely for irregular or bent protrusions. If you find them, then it is a defective roller. You should discard it immediately and NEVER use it. During the disinfection procedure, many people drop their derma rollers into their containers filled with alcohol, thus damaging their rollers. Never drop your roller! Instead, lower it slowly or gently into the container. To avoid getting your roller dirty, never place it on top of an unclean surface (For example, newspaper). Your working area should be clean! You can place your roller on a soft clean towel. Dirty hands can introduce bacteria, dirt and harmful chemical into your skin and roller, thus causing undesirable side effects. Washing your hands with an antibacterial hand soap before treatment is a must. Some users also prefer wearing medical exam gloves, but you still have to wash your hands before wearing them. How to Use a Derma Roller Correctly? Read this first before performing your derma roller session! 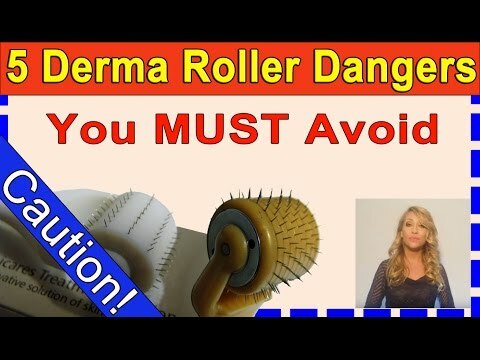 Important derma roller instructions on 1) how to treat your skin correctly with a roller 2) How often Should I Derma Roll 3) 4 common side effects. Where to Buy a Derma Roller? Are you looking to try a dermaroller? Discover the safest place to purchase a roller without paying a fortune. Is skin needling suitable for you and does it really work? Could it be a scam? Read and find out. What is the Best Derma Roller? Discover 8 important factors to determine the very best dermaroller without breaking your wallet. Here are 10 common questions and answers on micro needling. You will definitely find your dermaroller answers here. Do you know what to use after dermarolling? Easily improve your microneedling results by 150% with 5 powerful secret products. Quickly reduce wrinkles and scars. Top anti-aging secrets revealed. I hope this article will help you greatly, and you can enjoy a safe dermal needling experience. can I use alcohol swab /pad to disinfect my skin? Or must it be solution? You should use the pad intead. Also, you only need to disinfect your skin if you are using 0.5 and up. I recently microneedle my stretchmarks on my inner thigh I sterilised well. I used a single needle 2mm and it bled as I stamped densely. Is it normal to still be red after 11 days since the procedure? It is healing very slowly. Do you know how deep the dermis is on in inner thigh? Another girl said it took a few weeks before hers healed and it looked worse initially but healed well eventually. I greatly appreciate any help. We don’t recommend using 2mm if you never used a roller before. It is normal for your skin to become red. The redness should last 2 weeks or more with 2mm depending on the aggressiveness of the treatment. You may also experience flaking or mild peeling of the skin during cleaning. Hi. Can I use derma roller while having period? You should wait until your hormones are back to normal first. Is it safe to use toner after 4 days frpm the day u used derma roller on your face? I using celeteque toner product..pls! Answer my question.. I am not sure about celeteque toner. If your toner contains harsh or irritating ingredients such as salicylic acid, etc, then you have to wait about a week. Hi, after using the derma roller on your face (.25mm) is it okay to workout/sweat? Yes, it is ok, but the sweat can slightly irritate your skin. Please SO NOT put a dermaroller on a towel that’s a no non !!!!! Keep a cup with alcohol in it and that’s where you keep your roller between rolling. This very bad people will pick germs from the towel even if it’s clean and roll them deep into the skin. You need to use a clean towel. You can also keep your roller in the alcohol too, and that is a better option. Is this treatment healthy? & where can i buy this? Besides this website. Thanks. You can also get it on Amazon, Ebay, Overstock or Groupon. Hi I am currently using kojic soap and toner with gycolic acid..and I want a derma roller ,it is safe for me to use? You shouldn’t should harsh soap on your treatment area after a rolling session for 7 to 10 days.